Where: Banc of California Stadium, Los Angeles, CA. It’s time for Philadelphia’s first dance with MLS’ newest belle of the ball. The Union will travel to the “other” coast for their inaugural match against expansion side Los Angeles Football Club. While there may not be much history (or any at all) between the two sides, Saturday night’s fixture does feature two teams playing some of their best soccer. After last week’s convincing 4-0 win over Vancouver Whitecaps, the Union have crawled above the red line and into the final playoff position. Conversely, LAFC have won back-to-back games including a 2-0 victory over Columbus Crew in their previous match. The hosts currently sit in third place in the West and have yet to lose any of their six matches at Banc of California Stadium. Expansion teams aren’t supposed to be this good. So how did LAFC get so good so fast? The answer starts at the top. In head coach Bob Bradley, LAFC have a manager that led the United States to the knockout stage of a World Cup, achieved domestic success in Norway and France, and ever-so-briefly coached in the English Premier League. The former achievement, though, is what best set the stage for success in Hollywood. Think about what an international manager has to do. He needs to take an unfamiliar collection of players and quickly mold them into a cohesive unit. He needs to instill a tactical identity that is digestible but still complex. Doesn’t this sound a lot like coaching an expansion side? It also helps when you have talented players, and LAFC has that in spades. Center back Laurent Ciman isn’t just leading a serviceable back line, but his lightning-like free kicks have found the net more than any other player in the league. Twenty-year-old Uruguayan winger Diego Rossi already has five goals and four assists. It’s safe to say forward Adama Diomande has been prolific since being signed from Hull City on May 2. No player has scored more goals per game than the Norwegian attacker (four goals in four appearances). But LAFC’s most talented player is their No. 10, Carlos Vela. Vela is having an MVP-caliber season and is absolutely captivating to watch. Fortunately for the Union, the Mexican international will be in Russia helping his country take on Brazil in the World Cup rather than sunny southern California. While both have been eliminated, Costa Rican forward Marco Urena and Egyptian midfielder Omar Gaber will also miss the game as they return from Russia. Just as LAFC performed well shorthanded against the Crew, so did the Union against the Whitecaps. Philadelphia were again without a core member, midfielder Haris Medunjanin. The Union will be without the Bosnian for one more match, as he serves the final match of a three-game suspension. But in his place, midfielder Warren Creavalle has been exactly what the Union have needed. He’s been a steadying presence and a shield for the Union’s young defense. The bigger question will be which striker head coach Jim Curtin chooses to start. Unless injured, C.J. Sapong has been penciled into the starting lineup almost automatically. But the forward hasn’t recorded a goal or assist since April 28 against D.C. United. It might be time for Curtin to grab the eraser. Cory Burke wasted no time supplanting Jay Simpson on the depth chart, and the Jamaican has unquestionably outperformed Sapong this season. It’s time for Burke to be handed the reigns. 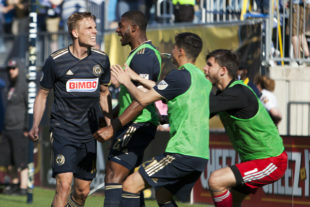 Despite their recent uptick in performance, the Union still have a gigantic, impossible-to-ignore hole in their game: they have not produced on the road. Continuing a horrific trend from last season, Philadelphia have secured a result in just two of their seven games away from home this season and have won only once in their last 19 road matches. If the Union really are a good team, it’s time for this stretch of poor play to come to an end. Key matchup and player to watch: Borek Dockal vs. LAFC’s midfield. The Union’s turnaround in play has as much to do with the success of No. 10. Borek Dockal as anything else. Since scoring a game-winning goal against Montreal on May 12, no player has produced more combined goals and assists in MLS than Dockal’s nine. Dockal put the cap on his recent performance last week against the Whitecaps, recording a perfect 10.o from Whoscored.com— the first Philadelphia player to do so. He was also named the MLS player of the week because of it. He was able to carve apart Vancouver with two goals. The visitors chose a passive approach that gave the Czech ample time and space on the ball. Don’t expect LAFC to do the same. Bradley’s men will likely press Dockal in possession. Usually, it doesn’t work because of Medunjanin’s ability to distribute from deep. Just ask New York Red Bulls, and they’ll tell you it’s nearly impossible to press the Union with both men in the lineup. While things have been going well for the Union, the same is true for LAFC. Until the Union beat a good team on the road, you cannot predict that they will, especially considering the home side’s record at Banc of California Stadium. And considering that venue has seen more than two goals scored only once, I’ll say the Union can secure a result in a low scoring affair. I will take a 1-1 draw at LA minus Haris… any day of the week. Keep the good times rolling boys!